I have been traveling quite a bit this summer and have finally made it back to my office. I have an early fall class starting next week, but I do plan on continuing the Second Temple period literature series through August. While I was speaking at West Coast Grace Youth Camp, I participated in a discussion for a podcast hosted by Collin Brown. He runs a site called Shirt Off Your Back (podcasts, videos, and t-shirts, except they do not actually sell t-shirts yet). Collin asked me to sit down with Mike McFadden, a youth leader and current director of the camp, for a discussion on youth ministry and Bible camps in general. I thought I was more or less unqualified to express opinions on these topics, but as it turns out ignorance is want makes for a good podcast. Feel free to invite me to opine on your podcast on whatever topic. The discussion ranged from the origins of youth ministry to current strategies for reaching millennial both now and in the future. For the most part this was stimulating for me, and hopefully to anyone who happens to listen to the podcast. I think we avoided the “get off my lawn” type discussions I hear when the topic of youth ministry is raised. Listen closely for a shout out to Mark Carroll. It is available directly from Shirt Off Your Back, or on SoundCloud and YouTube. There was no video for this meeting, which is good news; I have been told I have a face made for radio. After interviewing the demons, Solomon is visited by the Queen of Sheba, who is a witch in the Testament of Solomon 19. The Queen of Sheba visits Solomon in 1 Kings 10 and marvels at the glory of the Temple and Jerusalem and she is certainly not a witch. Testament of Solomon says she came before Solomon with “much arrogance” and was humbled before the king. Since the chapter is unrelated to the next, it is possible this is an insertion into the manuscripts. Later, the queen tours the temple, including the innermost parts of the Temple. She sees the altar, including the cherubim and seraphim over the mercy seat. She contributed a great deal to the building of the temple (ten thousand copper shekels, in 1 Kings 10:10 she gave 120 talents of gold, a great quantity of spices and precious stones). This paragraph serves as brief summary of Solomon’s building activities in 1 Kings 7:13-51. In chapter 20 Solomon demonstrates his wisdom in a variation of the biblical narrative in 1 Kings 3:16-28. Two men bring a case to Solomon an elderly son and his violent son. The demon Ornias is laughing and explains to Solomon that the old man wants to kill the son. Solomon sends them away for three days, after which time the old man “has become childless.” The interesting element of this story is the source of the demon’s information. When Solomon asks him how he knew wha the father intended, Ornias explains that demons go up into the firmament of heaven, “among the stars,” and they hear the decisions of God concerning men. The book returns to Solomon’s interrogation of demons in chapter 25. This final demon is called Abezethibou and came out of the Red Sea as a great pillar. This demon once sat in the first heaven and was responsible for hardening Pharaoh’s heart and the rebellion of Jannes and Jambres. Like Paul in Romans 9:16-17, this the presence of a demon absolves God of the guilt of hardening Pharaoh’s heart (cf. Romans 9:16-17. The tradition of two magicians in Egypt is found in 2 Tim 3:6-9. Although Exodus 7:11-13 mentions magicians, there are no names in the text. There are several rabbinic sources for Jannes and Jambres (b.Men., 85a; Exodus rabba, 7 on 7:11) and in Targum. Ps.-Jonathan. on Exod 1:15. This demon was engulfed in the waters to the crossing of the Red Sea and has been there ever since. The final chapter of the Testament recounts Solomon’s many wives, especially his great love for a Shummanite woman. It is possible this is an allusion to Abishag, David;s concubine who was a Shummmanite, or to the woman in Song of Solomon 6:13 (a “maid of Shulam”). But the story more likely alludes to Samson’s demand for a Philistine wife in Judges 14. The woman’s parents require Solomon to worship the gods Raphan and Molech, but he refuses. They threaten their daughter with violence if Solomon does not marry her and worship these gods, so Solomon relents because he so loves the girl and does not want harm to come to her. As a result of Solomon’s compromise, the glory of the Lord departs from him. This story provides an explanation for Solomon’s idolatry in 1 Kings 11. The canonical text indicates Solomon’s heart was not completely devoted to the Lord and he worship the gods of his wives. Here in the Testament of Solomon, Solomon is more or less forced to worship these gods in order to save his beloved from abuse and death. Nevertheless, Solomon describes himself as a “wretched man” who has become a laughingstock of demons. The phrase “wretched man” is similar to Paul’s in Romans 7, a man who knows what is right and chooses the evil instead. The Testament of Solomon begins with the story of a demon named Ornias who stole wages from a worker building the Temple and then sucked the thumb of a man’s son, sapping his strength. Solomon interrogates the boy and discovers the demon’s activities. Solomon prays to the Lord for help, and Michael gives him a ring through which he can imprison demons. He gives the ring to the boy and traps the demon. The boy turns the demon over to Solomon. The demon is brought to the throne of Solomon. Solomon asks him where he lives and he answers with a reference to the zodiac. He mentions he was once thwarted by the archangel Ouriel. Solomon prays to this angel, who comes and commands the demon to cut stones to help finish the temple. Ornias is given the ring and told to bring the prince of demons to Solomon. The rest of the book is a series of interrogations. Ornias brings a demon before Solomon, the demon is named, briefly described and then gives the way he might be thwarted. This usually involves invoking a powerful name, such as an angel or Jesus. Ornias goes to Beelzeboul and captures him with the ring. Solomon questions the prince of demons closely. Solomon asks Beelzeboul if there are female demons. He shows one to Solomon, Onoskelis, a beautiful woman who had the legs of a mule. Solomon questions here about her origin and activities and then commands her to spin hemp into ropes. Chapter 5: Solomon commands Asmodeus to be brought to him, whom he also questions. He explains his origins and activities (marring the beauty of virgins and causing murders), and he explains that the angel Raphael caused him to go away by burning the liver and gall of a sheatfish (a large catfish, cf. Tobit 6:2 for this method of exorcism). Asmodeus is command to mold clay into vessels for the temple. Chapter 6: Solomon begins to question Beelzeboul again. Beelzeboul “holds in his power the race of those bound by me in Tartarus. He is being nurtured in the Red Sea; when he is ready, he will come in triumph.” He tells Solomon he can be thwarted by several names, Eloi-I causes him to tremble and disappear. Solomon commanded this demon to cut marble for the temple. Chapter 7: Solomon interrogates Lix Tetrax, the demon of the winds. The name Lix Tetrax appears on a tablet from Crete and is associated with Ephesian magical texts. This is a “blast demons” sometimes found Aramaic incantation texts. The demon explains his origins and activities (whirlwinds and divisions), and tells Solomon three names which will cast him out (including the name of the archangel Azael). He is forced to raise stones for the Temple. Chapter 8: Solomon interrogates the seven stars of heaven, Deception, Strife, Fate, Distress, Error, Power, and “The Worst.” Their activities are fairly self-explanitory, but Error says “I am Error, King Solomon, and I am leading you into error, and I led you into error when I made you kill your brothers.” This refers to Solomon’s execution of his brother Adonijah (1 Kings 2:25). Solomon commanded them to dig the foundation of the Temple. Chapter 9: Solomon interrogates a demon called Murder, who is all limbs and no head. He claims “When infants are ten days old, and if one cries during the night, I become a spirit and I rush in and attack (the infant) through his voice” (9.5). He can only be stopped by a flash of lighting. Chapter 10: Solomon interrogates a demon called Scepter, who was in the form of a gigantic dog. This demon says “I deceive men who follow my star closely and I lead (them) into stupidity.” This demon helps Solomon obtain an emerald for the Temple. 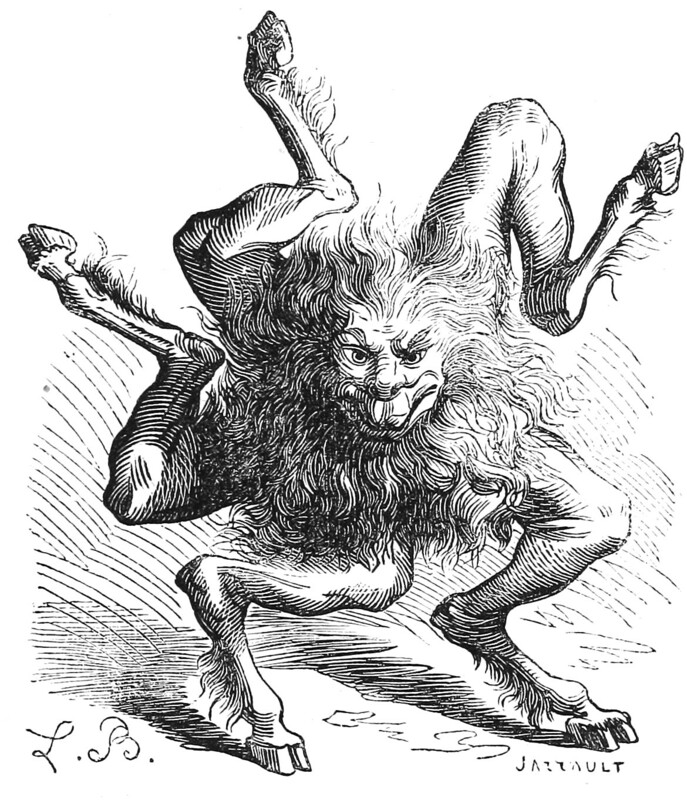 Chapter 11: Solomon interrogates a demon called “the Lion-Shaped Demon” who has a legion of demons under him. This demon “who sneaks in and watches over all who are lying ill with a disease and I make it impossible for man to recover from his taint” (11.2). Chapter 12: Solomon interrogates a three-headed dragon demon who can be thwarted by the “place of the skull,” an allusion to the crucifixion. He is ordered to make bricks for the temple. Chapter 13: Solomon interrogates Obyzouth, a female demon with disheveled hair. Disheveled hair evokes Medusa, guardian goddess of Aphrodite, but demons with wild hair also appears in Revelation 9:8. Obyzouth travels all night looking for women giving birth in order to make them strangle their baby. The angel Raphael thwarts her by writing her name on a papyri. Chapter 14: Solomon interrogates a demon called “the so-called Winged Demon.” This demon performs perverse acts in the night and sometimes copulates with beautiful women “through their buttocks.” He is countered by an angel in the second heaven named Bazazath, a name only appearing here in the pseudepigrapha. He is forced to cut marble for the temple. Chapter 15: Solomon interrogates a demon called Enepsigos. This female demon has countless names and can be conjured in many forms (including Kronos). The angel Rathanael can thwart her, but the Temple cannot hold her. Solomon inquires of the angel Rathanael and he is told he needs to use the seal of God. This angel prophesies to Solomon that his kingdom will be divided and the Temple will be destroyed until the Son of God comes and is stretched out on the cross. Chapter 16: Solomon interrogates a demon called Kunopegos, a spirit in the shape of a horse in front and a fish in back (a sea-horse?). He can change himself into a man and causes seasickness. In order to thwart this demon, one must go through a complicated ritual involving bowls and hemp ropes. Solomon sealed him with his ring and stored the demon away in the temple. Chapter 17: Solomon interrogates a shadowy demon with gleaming eyes. He has no name, he only identifies himself as a “lecherous” demon. He is thwarted if the name of the savior is written on his head. Chapter 18: Solomon interrogates thirty-six heavenly bodies with heads like formless dogs. Their names are listed with their activity (headaches, sore throats and other physical ailments) and the way to cast them out. This lengthy (and obtuse) listing ends the “interview” section of the book. As can be seen from this catalog, demons were associated with a wide variety of afflictions, from “perverse acts in the night” to Kourtael, who “sends forth colics into the bowels” (18.13). The interview section of the book is more or less a manual on casting out demons: match an affliction with the demon and then follow the instruction given in the text. This is the sort of thing the Sons of Sceva attempted in Acts 19, although they failed. The Testament also gives evidence of the association of illness and demonic activity. What is the Testament of Solomon? D. C. Duling argues at length that this Solomonic magical text was written in Greek, likely from Alexandria in the third century A.D. (OTP 1:940-943), although earlier scholarship argued for a much later date. There is no clear evidence of an earlier Hebrew version. As Duling concludes, “native language of the writer of the Testament of Solomon as a testament was Koine Greek” (OTP 1:939). Although the Testament is clearly a fantasy, the Greek Dialogue of Timothy and Aquila (c. 400 A.D.) quoted it as authentic. Despite the late date, McCown argued in his extensive study of the Testament that it “comes to be of assistance in reconstructing the thought world of the Palestinian Jew in the first century of our era” (McCown, Testament, 3). The format of the bulk of the book is a series of “interviews” with demons. They are forced to tell Solomon their name, where they live, and their activities, along with the way in which they can be “thwarted,” or cast out, captured, imprisoned, etc. Many times this can be done only by invoking an angel whose role it is to deal with that specific demon. The book is a valuable source for the understanding of magic and demons, although it is very difficult to know how much of this material goes back to the first century. Certainly there are several elements in the book which are parallel to the New Testament, especially in the use of so-called power words and incantations. Jesus does not use anything like Solomon does in this text, nor do the apostles when they cast out demons in the name of Jesus. However, when the sons of Sceva attempt to use the name of Jesus and Paul as a power word to control a demon, they are soundly beaten by the possessed man (Acts 19:13-16). In the same context, those who practiced sorcery burnt their valuable scrolls (19:17-20). In Acts 19:17 we are told the name of Jesus was held in high honor – perhaps a reference to Jesus becoming associated with the miraculous. The Testament of Solomon does NOT reflect actual hidden knowledge about real demons and should not be read as a manual for casting out demons. Despite the misunderstandings of this book published by esoteric teachers (especially in blogs and YouTube), the Testament of Solomon reflects the worldview of the first century, not actual reality. The first few fragmentary verses set the context for the testament. Moses called Joshua and commanded him to go forth in the strength of the Lord. Moses tells Joshua he was prepared by the Lord to be the mediator of the covenant and now he is about to die. Moses must pass along to Joshua some knowledge and books which he is to preserve. Moses tells Joshua will lead the people into the land, but some of the tribes will violate the covenant and commit idolatry. Chapter 3-4 “predicts” the fall Jerusalem in 586 B.C., the exile and the return from exile. Moses predicts they will be captives in the east for seventy-seven years (rather than expected seventy years). A prophet-like character will pray to the Lord on behalf of the nation, as does Daniel in Dan. 9:4-19. God will remember his covenant and return two of the tribes to the land, the other ten will spread out through the nations. Chapter 5-6 is prophetic speech concerning the Maccabean period. People will worship idols and “play the harlot,” a reference to Hellenism. Priests who are not truly priests will be active (the non-Zadokite high priests of the Hasmoneans). The prophecy into the reign of Herod the great (thirty four years in power, a wanton and rash man, killing both young and old). Chapter 7-8 is fragmentary but appears to describe “the time of the end” when people please only themselves and commit criminal deeds. Moses describes a great persecution, including torture and Jews forced to undergo reversal of the circumcision (8.3). Chapter 9 – This is by far the most difficult text in the book. A man from the tribe of Levi named Taxo will appear with seven sons. Cf. 1 Maccabees 6, the story of the martyrdom of Eleazar, 2 Maccabees 7:20f, seven sons martyred, parallel to 4 Maccabees 15. Tobias, in his final testament, has seven sons (Tobit 14:3).We cannot be sure what it is this Taxo does because the text is corrupt, but it appears he leads in a resistance against evil which leads to martyrdom. The poetic section is the high point in the book (ch. 10), drawing together numerous Old Testament apocalyptic themes and texts. It describes a kingdom during which time the devil will be at an end. The heavenly one will arise from his kingly throne and will cause the earth to tremble and make the valleys low. Unfortunately, the text breaks off at this point. What is the “Testament of Moses”? This book is called The Assumption of Moses in Charles, although the Testament and the Assumption may be two separate books. The only extant copy of the Testament of Moses is a Latin palimpsest dating to the sixth century A.D. This manuscript is missing a section and in other places it is illegible (OTP 1:919-920). Most Christian interest is due to the allusion in Jude to this book. The Testament of Moses comes from another pietist group of anti-Hasmoneans but is more focused on Herod, “an insolent king” who mistreats the people for thirty-four years (6:2-5). The reign of Herod is a terrible time, but one which was foreseen by God from the beginning of creation to the smallest detail (12:4). This view of “fate” corresponds to Josephus’ description of the view ascribed to the Essenes and Pharisees. There is less to work with in the Testament of Moses so we cannot know if the writer also held some sort of view of free will. Like the Psalms of Solomon, there is an expectation of a final consummation, although the details are confused. According to this book, a Levite named Taxo will arise and lead his sons to a cave where they will die rather than break the commands of God. A similar attitude is demonstrated by 1 Mac 2:29-38, the martyrs who refused to fight on the Sabbath. While this event took place nearly 200 years before Testament of Moses was written, the Maccabean martyrs were revered as patriots even in the first century. According to John Collins, R. H. Charles identified him as Taxo as Daniel “for no good reason,” Tromp thought he was Ezra, and S. Mowinckel took the name to mean “orderer”, as in “one who is over them” ((The Apocalyptic Imagination, 130 notes 54 and 55). Bibliography. M. Knibb, “The Exile in the Intertestamental Period,” Heythrop Journal 17 (1976): 253-72, reprinted in M. Knibb, Essays in the Book of Enoch and Other Early Jewish Texts and Traditions (SVTP 22; Leiden: Brill, 2009), 191-212; 200 n. 33. As with the other two patriarchal testaments, the Lord sends Michael to bring the soul of Jacob to heaven. He is told to order this household, and he says “let the will of the Lord be done.” He goes to his son Joseph and blesses him. Jacob is visited by an angel, but he thinks it is his son Jacob (also similar to the Testament of Isaac. The angel blesses Jacob and reviews his history – this angel has protected Jacob all throughout his life. After the angel ascends back into heaven Jacob is surrounded by his family and they weep over him. He prophesies that the Lord will make the people great in the land of Egypt. Chapter 4 recounts Genesis 48, Jacob’s blessing on the two sons of Joseph. This is remarkably accurate with very little expansion on the canonical story. Chapter 5 is similar to Genesis 49, the biblical “testament” of Jacob. After a short moral exhortation, Jacob is taken into heaven. The Arabic text is missing this ascension, the Boharic describes the Lord himself coming with Michael and Gabriel to take Jacob’s soul to heaven. Chapter 6 expands the canonical story to explain how Joseph kept his promise to return Jacob to Egypt. After Joseph completes his mourning for his father he worships God before the Pharaoh. In fact, all the elders of Egypt mourned Jacob attended the body when it was delivered to the tomb in Canaan. The author of the book steps forward and recommends the reader consult what Moses wrote in the Old Testament for further information about Jacob. The author gives a moral exhortation to be diligent in prayer and fasting in order to drive away demons, to avoid sin (a sin list is given). In 7.21 we are encouraged to honor the saints because they intercede for us. As with the Testament of Isaac, the twenty-eighth day of Misri is to be honored.